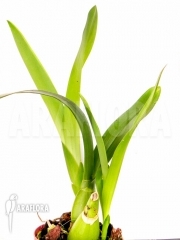 This is a Starter to grow your own Australian pitcher plant. This pitcher plant or Cephalotus follicularis is really special; a small carnivorous plant with reddish, cup-shaped snares. With these snares it catches and digests insects. 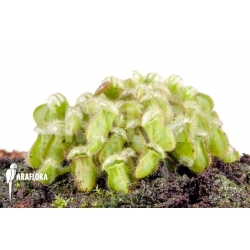 This is a Starter of the Australian pitcher plant or Cephalotus follicularis is a unique, carnivorous indoor plant. Its leaves are moulded into almost demonic-looking, red cup-like shapes. These cups look really dangerous with hairs and grooved edges. They serve as snares for the unsuspecting insects. The insects drop into the cup and cannot climb out again. At the bottom of the cup is a thin layer of liquid , in which the insects finally drown. The plant makes avid use of the dead bodies by releasing enzymes into the liquid thereby extracting the nutrients out of the insects.